Samsung’s Galaxy smartphones are controlled by touch, gesture, eye movement—and your mind. Well, not exactly that last bit. At least, not yet. Perhaps half in the name of science, half for publicity, Samsung’s teamed up with Roozbeh Jafari (University of Texas, Dallas assistant professor and wearable computing expert) to translate thoughts into common computing tasks using an electroencephalogram (EEG) cap. 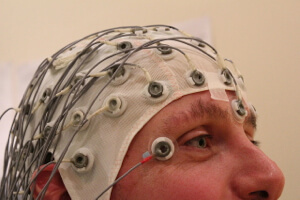 The EEG cap fits snugly onto the users’ head and uses electrodes to pick up the brain’s faint electrical signals. These signals fall into repetitive patterns when confronted with repetitive visual stimuli like blinking icons. The initial challenge was detecting and separating the right signals to accurately control the device. The news comes with a standard disclaimer: It’s still very early going. Though the team is using a “dry” EEG cap (most use gel), it still bristles with electrodes, and the system’s slow—one interaction per five seconds. So don’t hold your breath for a mind-controlled Samsung phone or tablet. The firm has no such plans. But down the line? Who knows. There’s potential for this kind of technology to assist quadriplegics and those suffering from locked-in syndrome. The system’s 80%–95% accuracy is enough to be of use. 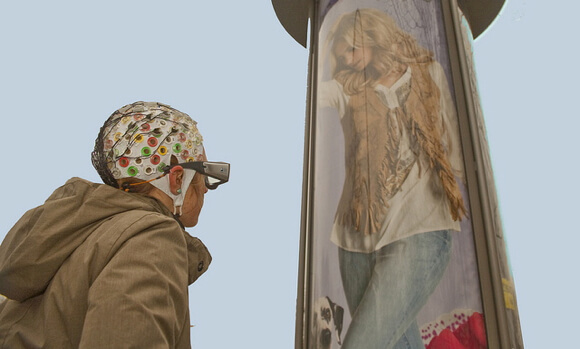 And whereas past examples of brain-controlled devices for the disabled—like this wireless thought-to-speech device and, more recently, BrainGate2’s mind-controlled robotic arm—are brain implants, EEG is non-invasive. Whether this tech shows up in commercial phones, tablets, or life-enhancing devices for disabled folks—it’s pretty amazing you can think a thing and make it happen onscreen. What will we control with our thoughts ten and twenty years from now?